Would you like to grow professionally? Promote change in the field of family child care? Develop leadership skills or be a mentor? Find a mentor? Make new friends who really understand what your job is like? Whether you are interested in advocacy issues, continuing education, career development, or just want to connect with other family child care providers, Wisconsin Family Child Care Association is the organization for you! 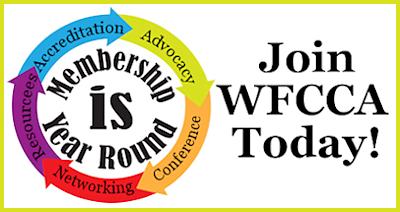 Benefits of WFCCA membership include high quality trainings, access to helpful resources, early childhood and family child care advocacy, and valuable networking and professional development opportunities – all geared toward family child care providers. Join WFCCA or renew your membership today to receive all the benefits membership in a professional family child care organization provides! Membership in WFCCA is open to anyone who is committed to supporting family childcare and early childhood. To become a member, complete and submit a membership form online or through the mail. For online membership form submission, choose your membership option below, click "Buy Now," then enter your information on the next page. For mailed-in membership forms, download the membership form, then complete and submit it with payment to the address listed on the form. Choose the membership option that is right for you. To help you choose, the costs and benefits of each option are listed for you. Please contact us if you have any questions. $65.00 value. Save $5.00 by joining WFCCA and NAFCC at the same time. E-newsletters from NAFCC and WFCCA emailed directly to you. Local benefits may also be available in specific regions. Reduced conference registration at WFCCA Statewide conference. WFCCA e-newsletter delivered to your inbox. Additional benefits may be available in certain regions. Design by Metamorphozis Designs. Modified by A. Nogar. Copyright ©2018. ALL RIGHTS RESERVED.